Your food truck. It’s a culmination of your entrepreneurial spirit and a dream, and likely based in part on your passion for cooking. It’s also your business and needs to be insured like one. Getting the right insurance for your food truck doesn’t have to be complex. In fact, when you break it down, there are just three areas that you’ll need to insure: Your food truck/trailer, your business, and your employees. And to protect all three, you’ll need four types of insurance that include: Commercial auto liability, commercial general insurance, business personal property insurance, and worker’s compensation. As the first installment of our Food Truck Owner’s 101 Insurance Guide, we’re going to walk you through some of the key points you need to know to properly insurance your food truck business, starting with the most obvious insurance coverage – your commercial auto liability. All too often a novice food truck owner will have his or her insurance agent add a business usage endorsement onto an existing personal auto policy thinking they’re adequately protected. Don’t make this mistake! A commercial auto policy offers much higher limits, allows for variances in truck styles and modifications, and allows for different types of usage and a lengthier travel radius. Non-owned: Vehicles that are owned by an employee or volunteer and used some or all of the time for business purposes. It’s important to discuss the vehicles involved in your business with your agent. Because while you may not have employees behind the wheel of your food truck, you may need them to use a rented or even their own personal vehicle for business purposes such as running to the store for supplies. Remember, if an employee gets in an accident while driving a vehicle on behalf of your business, you could be held liable. • Uninsured/Underinsured Motorists – When another motorist damages your food truck and has no insurance, or has very low policy limits that are not enough to pay the claim. • Medical Payments – Regardless of who may be at fault, medical care for the driver and passengers of your food truck are covered. • Comprehensive – If your food truck falls victim to theft, vandalism, or is damaged by severe weather. • Collision – Best case scenario, you hit a curb and damage your truck. Worst case, you overturn your food truck. Collision coverage helps you pay the auto shop bill. • Rental – Provides you with the cash for a rental food truck while yours is at the shop. 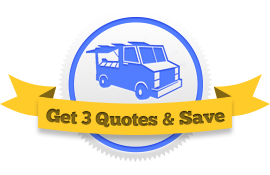 • Towing – Pays for the cost to tow your food truck after an accident to the nearest repair facility. • Cargo – Covers the repair or replacement of items not permanently attached to your food truck. • Product Injury – Provides coverage in the event one of your patrons is injured. For example, a foodborne illness or a hot food product that causes an injury. Even with medical coverage, product injury will pick up where a claim may exceed the policy bounds of bodily injury in your auto policy. Ready to shop for commercial auto liability insurance and start to compare the rates? Here are some quick tips we think will help before you go gathering quotes. Define your business operations and ask about tailored coverage to meet your individual needs. Be clear about whether your business is daily, weekends-only, or seasonal. Map your business boundaries and ask about local laws. Estimate your mileage and describe your operating locations. For example, corporate business districts and shopping malls may need a different level of coverage than sandy beaches and college campuses. Have readily available the value of your vehicle and any specialized modifications. Take a detailed inventory of everything inside your truck. Take pictures and note the costs to replace permanently attached equipment and accessories such as grills, refrigerators, radios, and GPS units. Ask about discounts for bundling policies or for removing unnecessary optional coverages. Prepare a list of vehicles used on behalf of your business, as well as a list of authorized drivers. Your agent can run motor vehicle reports on drivers to ensure that you’re not putting your business at risk. Keeping your insurance rates manageable allows you better manage your monthly budget. But remember, it’s never a bargain when you buy a cheap policy that doesn’t give you the coverage you need in the event of a loss. Hire safe drivers. Employees with unblemished driving records will be cheaper to insure. Secure a group discount. If you’re insuring a fleet, lock in a lower rate with a bulk discount. Consider your operating hours and mobility. For example, is your business strictly a seasonal operation? Does your truck spend most of the time parked? You may only need coverage during certain months of the year, or less coverage due to low mileage. Consider increasing your deductible to a comfortable level. A deductible that’s too low inflates your premium. Shop around and compare quotes from more than one agent. At Food Truck Insurance HQ, we hope you found this information on food truck auto liability helpful. While it’s not inclusive of how a commercial auto policy works or the coverage it may contain, it’ll get you that much closer to finding the right coverage for your business before you open your window for hungry customers!